It’s been said that the Army does more things before breakfast than the rest of us do all day. In the case of Jeff Struecker and Alton Gansky’s latest novel, so much happens in less than 24 hours that it takes 369 pages to tell it all. But don’t worry—just like the time did for their secret Army search and rescue team, the pages will fly by. Along with the bullets. Bullets, yes, and a plot loaded with espionage, danger, and heroics. Set in the former Soviet republic of Kyrgyzstan, Hide and Seek is exactly what a fictional pair of politically connected women and an intrepid Special Operations team play, only theirs is no game. Just like in real life, America’s war on terrorism is going badly in Afghanistan. Our forces are renting space at an airport in Kyrgyzstan’s capital, Bishkek, from which strikes into Taliban territory are being launched. Russia and China are offering billions of dollars to the economically beleaguered country to force the Americans out, an offer that resonates among many anti-American Kyrgyzs. United States officials know our welcome in the country is hanging by the thinnest of threads, and are trying to tread lightly. Their efforts are only compromised further when a haphazard coup erupts in Bishkek. Some gristly video footage of a botched kidnapping is broadcast, showing one of our heroines—an American officer—fleeing the scene with the daughter of Kyrgyzstan’s embattled president. Although having strict orders to stay out of the country’s political turmoil, American Army officials cannot risk either of these women falling into the wrong hands. So an intrepid Master Sergeant is conscripted to covertly lead his team into the perilous streets of Bishkek and find them. Co-author Struecker may be a Baptist pastor today, but he’s also a retired Army Major, and the credibility his experience lends to this story makes what borders on a marginal Hollywood script come to life. There’s just enough human frailty to make this team’s exploits believable, and just enough humorous banter to lighten what would otherwise be a constant barrage of mayhem, thugs, and deceit. Oh—and the Master Sergeant’s wife? Pregnant. With twins. She’s living stateside, working as a consultant to the military. It’s all part of our modern Army. If you’re not in the military, this book may be an eye-opening opportunity for learning about the type of warriors our country employs, people who are expected to bounce between professional and family roles like civilians do in our workaday world. Things get a bit far-fetched toward the end of Struecker and Gansky’s storyline, when they throw some biochemical weaponry into the mix. It’s hard to believe an American Special Ops team would intentionally expose an entire city to possibly imminent peril by attacking an unfamiliar building housing an unknown substance whose lethality is also unknown. Hopefully, that’s not something the Army considers doing on a regular basis. Overall, however, Hide and Seek provides a plausible insider’s peek into the ways believers who serve in our military put their lives on the line for our country. It’s easy to even imagine parts of this narrative being lifted from true events during Struecker’s Army career. At least we’d like to think our men—and women—in uniform are this brave and competent. If you or someone you know serves in our armed forces, this book might introduce good talking points about what real life in the military looks like. 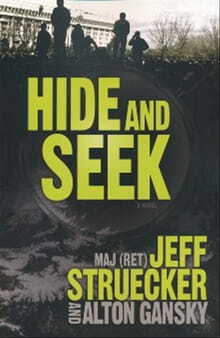 And if it looks anything like Hide and Seek, no wonder our soldiers think they’re underpaid.